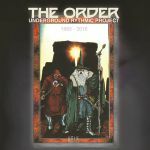 Review: Originally found turning out sublime deep house in the early 90s alongside the heady work of peers such as The True Underground Sound Of Rome, The Order were a four-strong group that made no secret about their passion for Detroit techno. Male Records, who originally released their Underground Rythmic Project release back in 1992, have brought these infectious productions back to life with a timely reissue that aligns perfectly with the gems being unearthed on Vibraphone Records at present. As well as the four original tracks from the group's sole EP, the excellent unreleased cuts "Quasar" and "Way Back" are included on this wonderful document of early Italian techno.